AMC has just inked a deal with Justified’s Chris Provenzano that should help keep Stetsons on the air: As part of an overall deal with the network, the former Mad Men scribe is working on an adaptation of Gunsights, a 1979 Western novel from Elmore Leonard (and considered to be his last in the genre). Set in 1893, Gunsights is the story of tough guys Dana Moon and Brendan Early, former Army buddies whose lives remain intertwined even after their tours of duty are up—after settling in Arizona, Dana and Brendan end up on opposite sides of a land grab. Of course, it’s not a simple matter of good versus bad, what with this being an Elmore Leonard story. 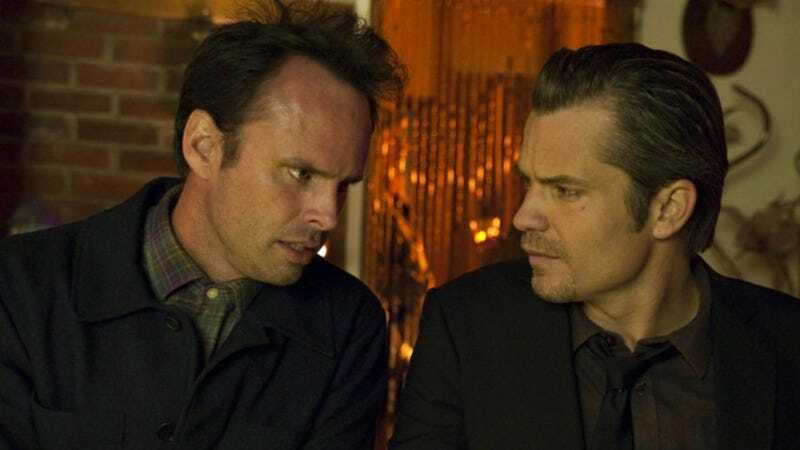 Just like our old friends Raylan Givens and Boyd Crowder, the two men are given plenty of opportunities to square off, but not enough reasons to want to kill each other. Not much else is known about the project, though Deadline posits that AMC was scrambling for a new Western project in a world without Justified and, soon, Hell On Wheels. Provenzano also worked as a story editor on five seasons of Justified (which was based on the Leonard novella Fire In The Hole), so we can probably expect the men in Gunsights to shoot lots of things—bullets, quips, people, etc.